Organised by the good people at Hasbro Singapore, this year sees the NERF POWERPLAY return once again where teams battle it out in a specially designed areana inspired by an Urban Close Combat Setting. Kenneth Wong, Ken Koh and Alex Tan braves the screaming crowd and flying Nerf Blaster bullets to check out a competition like no other. 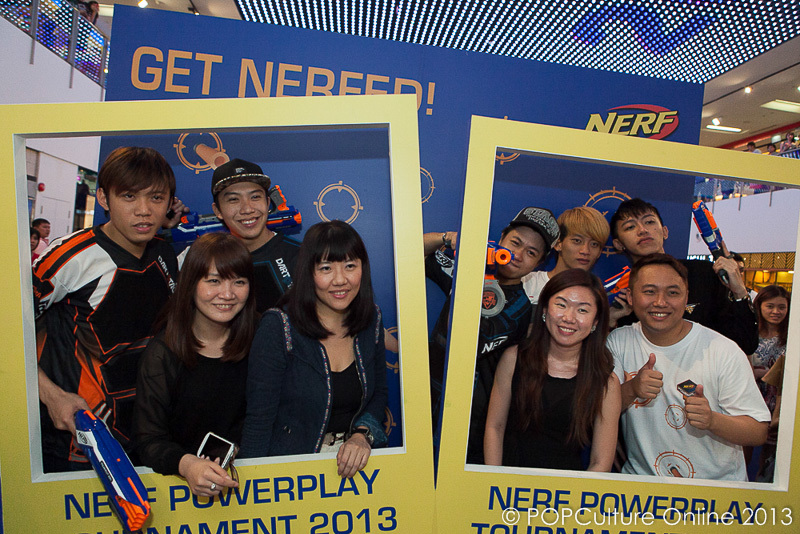 The NERF POWERPLAY tournament is the third of its kind held in Singapore by organisers, Hasbro Singapore. 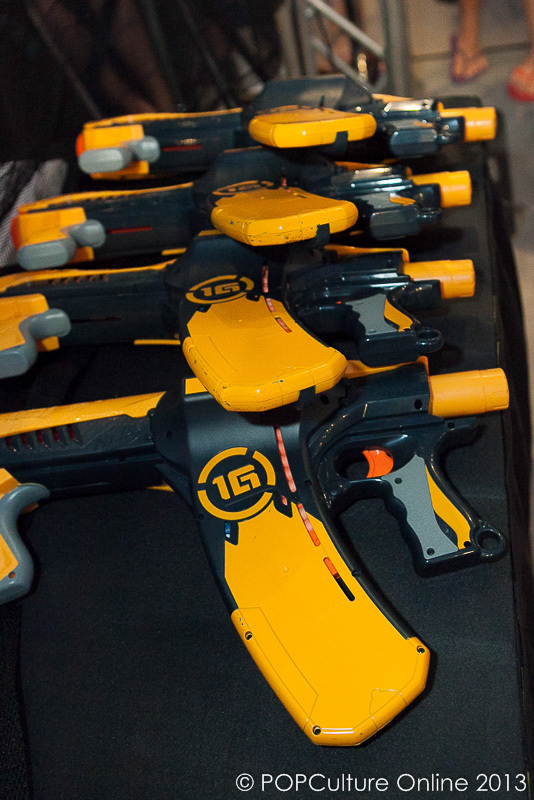 This year though, the event has been put together as a launch pad for a series of NERF-related events due to unfold throughout the rest of the year to encourage the community to play NERF socially and actively. 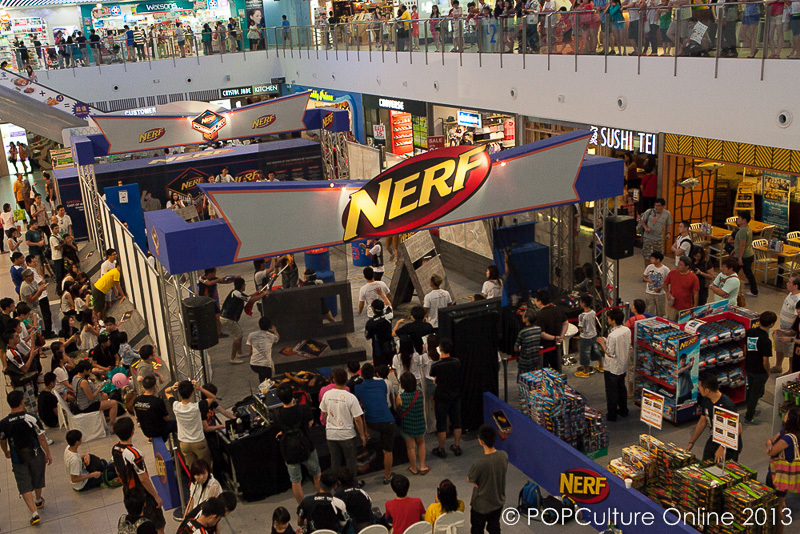 Held at the atrium of NEX Shopping Mall over the weekend, the NERF POWERPLAY 2013 saw 64 teams battling it out across two main categories amidst an on-looking crowd of eager spectators who rooted for their favourite teams. As with all competition, there can only be one winner and this year’s tournament sees team “S-16 Command” take the title for the Open Category and team “NoobBusters” take the title for the Youth Challenge. While it looks like all fun and games, it can be serious business as Jun Jie from S-16 Command tells us. Practicing every Sunday with this team to ensure they get the details down, he also had praise for his opponents as he recalled the many close fights as all his opponents were very strong skilled. NERF fans were also treated to an appearance by the Ah Boys to Men cast which included Tosh Zhang, Noah Yap, Wang Wei Liang, Charlie Goh and Maxi Lim who turned up amidst a cacophony of screams and cheers from excited fans who came down especially to catch a glimpse of the young stars managed by JM Artiste Network and FLY Entertainment. The quintet put their NERF skills to the test in three specially arranged match-ups against their fans. “Before today, we underestimated how intense playing NERF can be. It’s a real workout!” said Wei Liang who partnered two fans in the first game, said Wang Wei Liang addressing the crowd whilst wiping beads of sweat from his brow. Added Noah Yap, “A few of us actually booked out a multi-purpose hall a couple of months ago just to practice playing NERF. We used school tables and chairs to form the obstacles and barriers. Playing it here today with officials and umpires is a different experience, but really, NERF can be played anytime and anywhere”. The Cast also were thankful of their fans who made the effort to come down to support them in the event. Even though Ah Boys To Men have been out for quite a long time, it was very heartwarming for them to still see their fans cheering them on. They ended off with a special “We Love You” message to all their fans who were down on sunday. 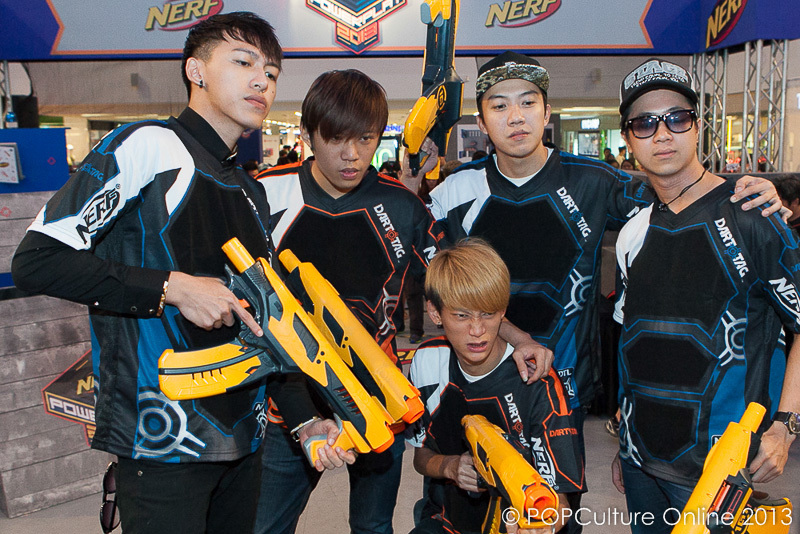 “The NERF POWER PLAY 2013 was a perfect way for us to unite the NERF community in Singapore and re-introduce the sport to neophytes. NERF has always been a sport that can be played by people of all ages, at any place, and at any time. All you need is a couple of friends or family members to enjoy an active day out.” said Miss Joy Koh, General Manager of Hasbro Singapore. “Moving forward, we want NERF fans to know that they have our support in all things NERF and we will be working closely to existing and new interest groups to build on NERF-related initiatives to encourage more NERF action in neighborhoods and parks across Singapore,” Miss Koh added. Miss Koh’s words were further enforced with many enthusiast from all walks of life who turned up for the event. One group, or should I say family of regular NERF players included the Choo family of Aaron, his wife Fern and their son Marcus. 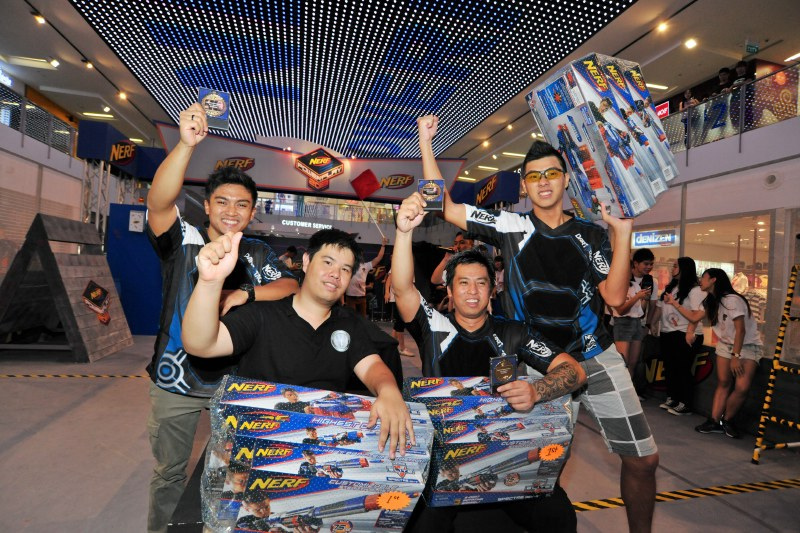 With a stable following of NERF enthusiasts promising to light up the sport in communities across Singapore, the social element of NERF is expected to continue throughout the year and into 2014. Hasbro Singapore will also be releasing new models of NERF blasters in the coming months, adding onto its already impressive line-up of NERF Elite blasters of which the NERF Elite Alpha Trooper CS-12 and NERF Elite Spectre Rev-5 were amongst the latest released exclusively at NERF POWER PLAY 2013. 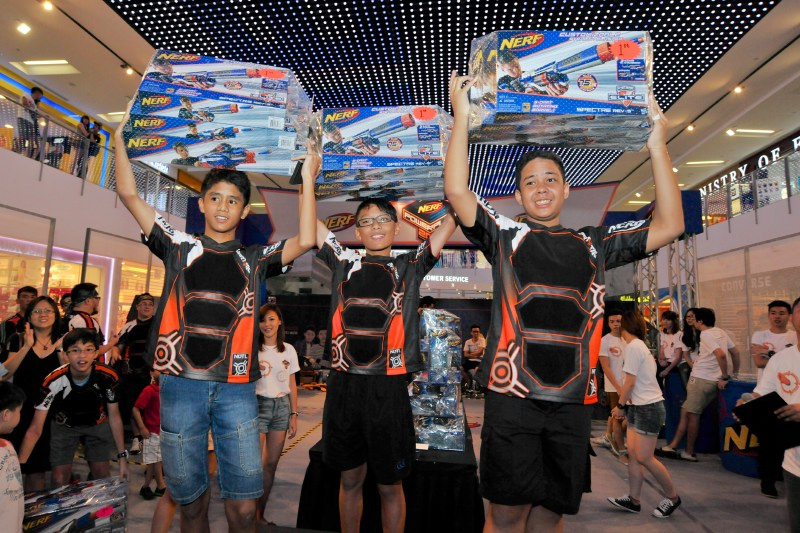 For more information on NERF or other exciting Hasbro products, please visit www.nerfpowerplay.sg. You can check out all the action over at our Facebook page photo gallery.